This is the top Christmas Display idea of all time! Thank you for sharing it Liz. 'At present we have the most successful display EVER in our library, but I'm very sorry to say it wasn't our idea! 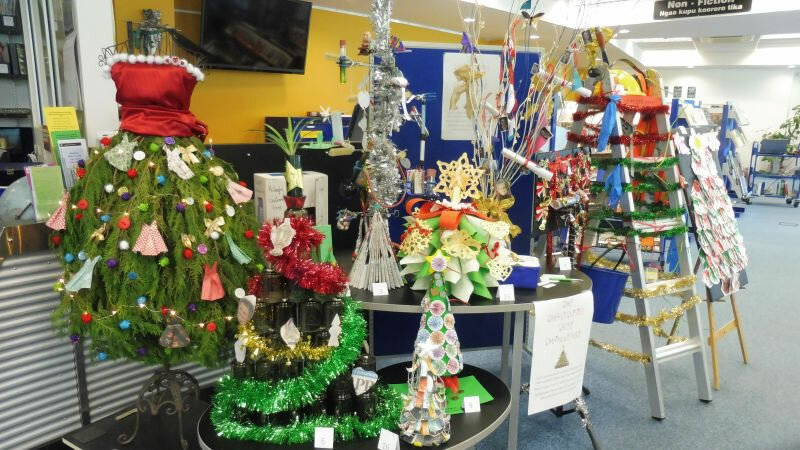 The Science department asked everyone to create a Christmas tree that represented their department in some way, and they're on display in the library for students to vote for. The best thing, apart from the amazing creativity, is that staff are all coming over to see them, so it's been a lovely social time and brought people to the library who seldom, if ever, darken our doors.. The Fashion department made a Christmas tree dress, Science had lots of test tubes, ESOL had lots of flags, Property used a ladder, the Preschool made a tree of hand-prints, Social Sciences did the 12 days of Christmas. 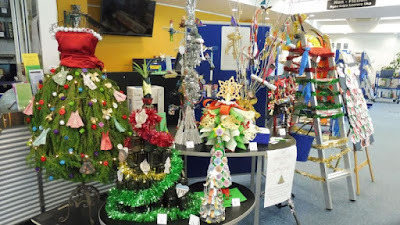 ....And we of course used books, and also made a magazine tree." I love this idea! May have to try it one of the upcoming years in my school library.